What fun this was. I have another of these panels and can't wait to get it done as well. Why did I wait so long? I treated it like an applique and stitch in the proverbial ditch and then echo. Add some background fills and you've got a really sweet Shower gift in a jiffy!! Took me 4 hours to quilt this one. 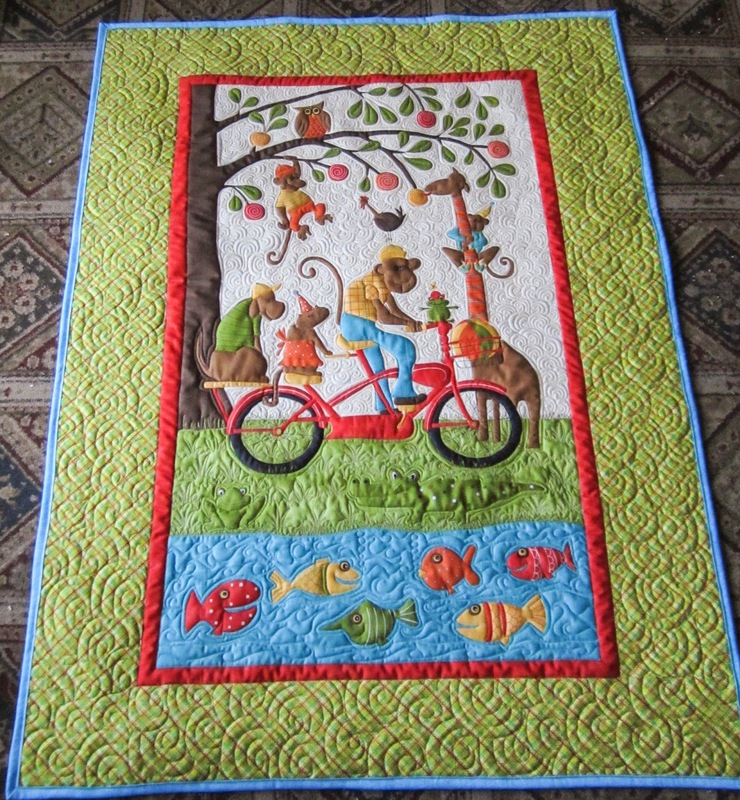 I think the next one I will cut off the fish so that it's a more normal size baby quilt. Invisible thread for the outlining, Glide for the background quilting, Bottom Line in the bobbin. 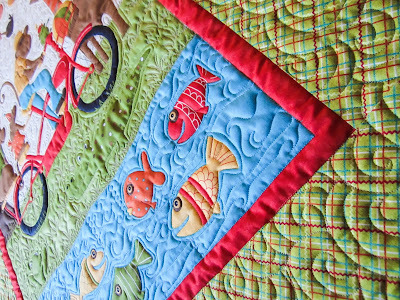 Free motion quilting large swirls in the border, small swirls in the sky, grass and waves. Batting is Hobbs 80/20. A nice cozy flannel for the back and it's ready to go in the washing machine. 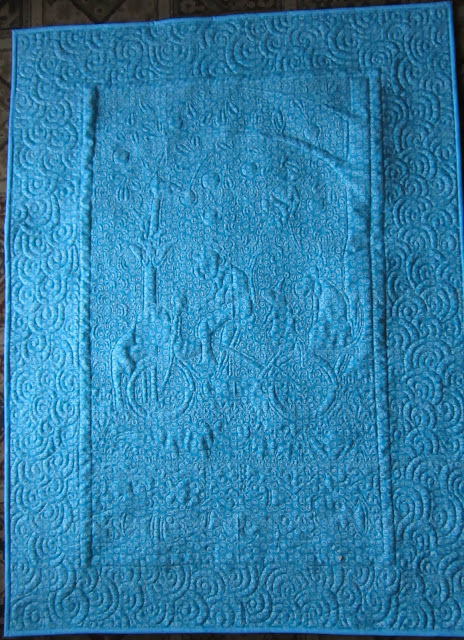 Here's the last of the four stocking that quilted. I had all four of these on the frame at once. I drew the outline of the front for all four and just had fun quilting. Then rolled it and did traced the 4 backs - this backs just got simple quilting. The last one is the "reindeer antlers" by the time I did that one I just wanted to be done. It was suppose to be snowflakes but I got lazy. I saw the stencil that I had and thought it looked close enough to Antlers for me!! I think the poinsettia flowers and the Christmas light are my favorites out of the bunch. So far I have 9 of the stocking sewn together and 4 that are completed. I've got some time to finish up the rest of these right ;) I quilted the names and then used fabric paints. I think on the next ones I'll try making the cuff a bit bigger. I'll add a few pictures on how I did the cuff as well. The big question I have is what do you do with all those flannel scraps? I've used flannel backing on the last 10 or so quilts and the extras from all the stockings. Now what do I do with all those scraps? Your Lollipops looks so good, it's hard to believe it is 'just' a panel! Love your stockings as well - a great idea! I love the panel, and the stockings are just extra special. my extra flannel usually gets cut into squares and eventually become baby quilts. You really dressed up that panel, so cute! I use my flannels, minky, and plush scraps just like any other scrap. They can be mixed in with cottons for a texture, or just together, or I like to 'box' them with a solid for a fun baby quilt - little finger feely patches so to speak. Love the panel and the stockings. 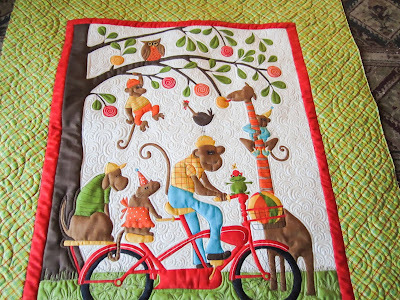 Your quilting is always so inspiring, Sue! Those are just amazing socks I had never seen something so amazing done. Great Idea. Well, you've done it again. The panel looks like you spent a lot of time doing applique before your wonderful quilting: sneaky. And I love the socks. I machine knitted 26 individualized Christmas socks one year so I know what a really big job you set for yourself. Good going. 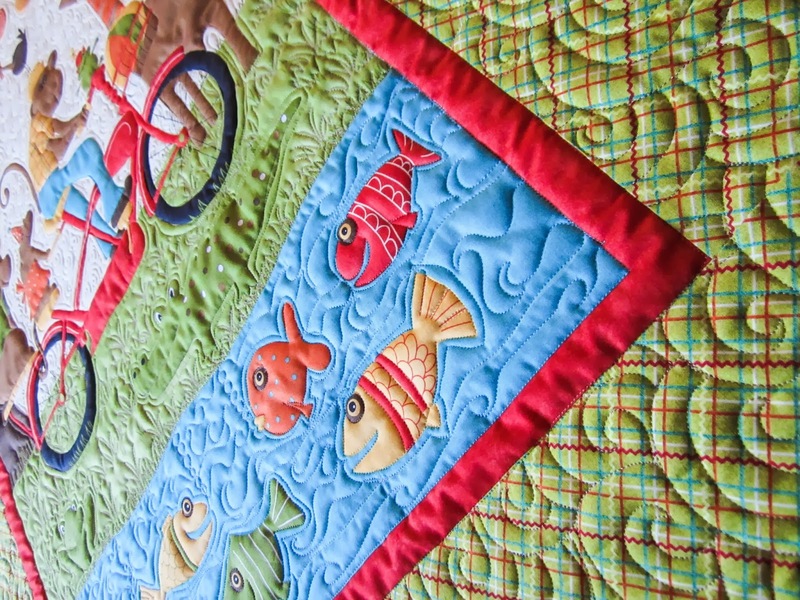 Your quilting is stunning, as usual. Love the panel idea. I'll check to see if I have a panel I could do the same thing with. Thanks for the idea. You are such an inspiration! I'd love to make stockings like that for my grandkids;hope I can remember that for next year. I collect what I trim off from quilts into a large trash can. When it's full, I bag it up and donate it to a woman who uses my scraps to fill pet beds for the local Humane Society. You've taken the simple panel and made it into a stunning picture, Sue! Love it! I'm going to buy a panel so I practice my FMQ which is Neanderthal compared to your fabulous work. I see one stocking has my name on it! Your quilting is stupendous! Love the panel and the stockings. Cute panel done up, love the stockings too. You could always donate your flannel to bundles of love-they use it for bib's and blankets. Super great job on that panel Sue!!! You made it look like so much more than a panel :) And the stockings are amazing. I'm making a stocking for my SIL and was trying to decide how to put his name on the cuff - thanks for the ideas!!! Beautiful work with the panel and your stockings are so neat! How about a rag square quilt with the flannel leftovers? Thanks for sharing.